The Latest Gabriel Allon novel by Silva. Gabriel and his wife Chiara have retired from the spy business and moved to England to begin a quite life as an art restorer. Meanwhile an old acquaintance is murdered and in the process a priceless unknown painting by Rembrandt is stolen. 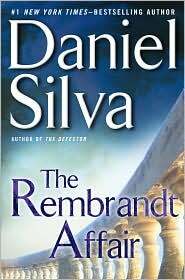 An old friend with his entire business at stake since the painting was not insured asks Gabriel to solve the case and get the Rembrandt back. The affair starts out being a simple art theft but ends up putting Gabriel and Chiara back in their old business and ends up involving spy officials from Israel, UK, USA and Switzerland before it is over. The search takes Gabriel to Amsterdam, Argentina, Italy, and Switzerland. Turns out the painting was originally taken from a Jewish family by a German Gestapo officer during WWII. It ended up being part of a fortune confiscated from Jews and ultimately ended up funding a Swiss bank and became the foundation of an empire built by a famous billionaire Swiss industrialist. Many over the years had been murdered to maintain the secret origins of the fortune. In the end the painting is recovered and given back to the sole survivor of the Jewish family who owned it. I have left out all of the fun parts. A novice British journalist goes undercover to get the info needed to bring down the Swiss billionaire. Another non-stop action–can’t put down book by Daniel Silva with all sorts of familiar characters from previous books in the Allon series. One not to be missed.